Earn up to 16,495 reward points. Innovative design for playing perfection. The Majesty 7-string delivers the performance, playability and attention to detail that you would expect from a guitar that springs from the fertile imagination of John Petrucci and the skilled craftsmen at Ernie Ball Music Man. Optimized for precise technical playing while maintaining a wide range of tonal versatility, the neck-through design is conceived for unmatched access to the full range of the fingerboard, with ergonomic control placement and a new digital pickup switching system for seamless tonal selection. From Petrucci's signature DiMarzio Illuminator pickups to the floating tremolo piezo bridge, the Majesty 7-string is a triumph of the marriage of innovative musical technology and the instrument builder's art. Advance your playing. 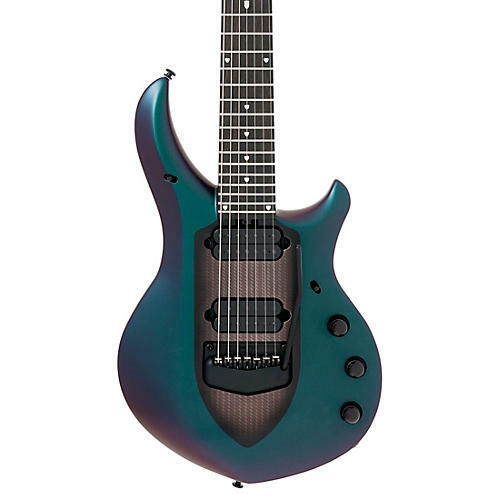 Order a JP Majesty 7 today.